← What Would The Greatest Generation Do? Since I had written a post telling of my fun with the insurance company I was trying to sign up with through the ACA, I thought I would follow up with a short update. I now have a card and have actually been to a health care provider a couple of times. Like many I have some blood pressure problems. Nothing too dire, but needs attention. Since I will soon be eligible for Medicare, other tests and treatments can be delayed for a bit. While the ACA has been a tremendous positive for America, based on my recent experience it is still a bit early to trust insurance companies to fully comply with the ACA. I have an option that others don’t have which is to wait for Medicare. The ACA is definitely a step in the right direction. I remember full well the nights I would lay in bed trying to decide if that pain or this sensation was worth a trip to the doctor. Since my “insurance” at the time had a high deductible plus the old “pre-existing condition” clause, I could pretty much figure that every visit would be on my nickel. Since doctors post no fee schedules, I may as well as just given them my checkbook. It is not as if I could make a guess as to what the fees and other services might cost. For five years or more I had to endure what may have been warning signs of a heart attack, sprained ankles, a shoulder that was so painful that I would cry and many various ailments just hoping and hoping it was nothing really serious. I am out of that hell now. Now thanks to President Obama, I do not have to lie in bed wondering if I am dying – wondering if I take a chance at bankruptcy to get treatment. I know I am far from alone with what I went through. Of course I blame the Republican congress and Charles Grassley for the hell I went through unnecessarily. I saw the hearings and I read the stories. Republicans and in particular Grassley were resolute in stopping bringing our health care system into the modern age. Not just during Obama’s presidency but since the presidency of FDR. For that reason alone I would never vote for any Republican. What is really sad is that the power behind the Republican party is still fighting hard to return us to those dark days. And they are fighting hard to end Medicare and Medicaid. Why would I ever want someone who hates America’s citizens so much that they would bring back this form of personalized terror to our country. I truly thank President Obama and Congressmen Loebsack and Braley and Senator Harkin for standing up for us. You can not imagine how much relief I feel every day knowing that if I have a medical problem I do not have to sit in fear and try to decide between dying or going bankrupt. It wasn’t funny folks, it was reality in my life and many, many others for a long time. Thank you, Mr. President. Thank you, Congressman Loebsack. Thank You, Congressman Braley. Thank you, Senator Harkin. Believe me, it almost makes me cry to be covered for medical finally. This entry was posted in Affordable Care Act, Bruce Braley, Charles Grassley, David Loebsack, Health Care & Medicare, Medicare, Obamacare, Tom Harkin and tagged ACA, personal story. Bookmark the permalink. 1 Response to Thank You, Obamacare! , I am a video producer at US Dept. 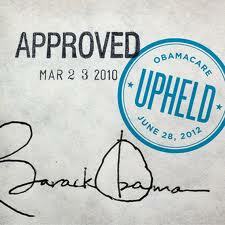 Health & Human Services and have been working on the education campaign around the Affordable Care Act. Goes without saying that there is a lot of misinformation out there and we have found that having “real people” share their stories is effective. So even though enrollment over for 2014, suspect that in next few months we will be gearing up to do more profiles. One of my jobs is to find people to share their stories as part of the education campaign. Hoping you can see if any of your readers would like to email me their story-especially looking for those under 35 and with good visuals-like a farmer.